You know how when you don't feel good, it's hard to go to bed, because you just lay there and think about how much everything hurts? I got that. Naturally, I am distracting myself with the computer, but it's a bit hard because my right index finger stopped working a few hours ago. And typing without your right index finger gets a little tricky, but I am DETERMINED to win this pretend fight with myself. Meanwhile, my kids have told me about 100 times that Brave is in the movie theaters. I should say movie theater, because there's only one theater close to us. Do you know how stupid that is? I feel like I live in a pretty well-populated area, and that we should at LEAST have two movie theaters. AT THE VERY LEAST. 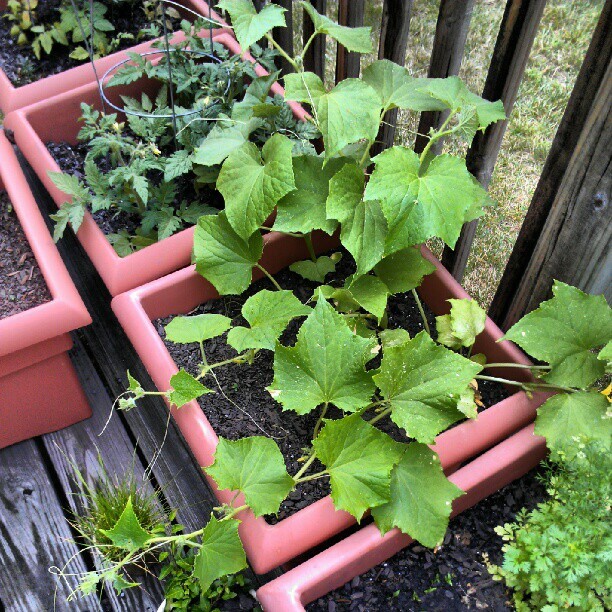 Now look at my cucumbers. I love my little container garden.